Cruising the coast in a modest kayak is one of the most calming ways to enjoy the open ocean, and also a good way to see the sights without causing too much disruption to the wildlife beneath you. 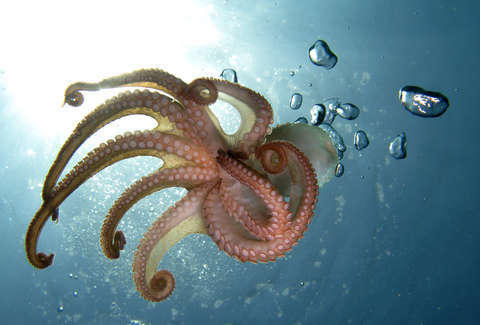 However, one unsuspecting dude recently learned that the sea always has a few surprises up its sleeve, when a seal popped out of the water right next to him with a live octopus in its mouth and slapped him in the face with it before slinking away like nothing happened. On Sunday, avid kayaker and GoPro enthusiast Kyle Mulinder was out paddling and filming with a group off the coast of Kaikoura, New Zealand, when suddenly, he noticed a seal swimming quite rapidly toward him. Before anyone really knew what was going on, the seal darted toward Mulinder's boat, crested the surface quite dramatically with a big ol' live octopus in its maw, and slapped him square in the face with it, leaving the man on the receiving end of the blow (and presumably the tentacled creature) stunned by the turn of events. Neither were injured, but the best part is that Mulinder's buddy Taiyo Masuda got it all on camera from a few feet away. According to Mulinder, the seal and octopus had been fighting for a while before he got in the middle of it all, as he explained in an interview with Yahoo 7. However, the fight apparently disappeared underwater just before the smack occurred. While the brouhaha between seal and octopus was inadvertently broken up by Mulinder's face, the octopus was clearly not ready to hop back into the water and tempt fate. It clung desperately to the side of the kayak, and Mulinder eventually needed the help of the group's instructor to get it off. But, hey, at least it wasn't a shark.